Councillors have agreed to spend £18m on a new hospital and leisure centre complex in Berwick. Northumberland County Council's cabinet said the project would link "treating illness with preventing it in the first place". 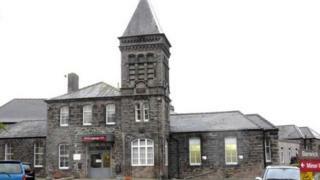 The new facility would be on the site of the Swan Centre in Tweedmouth and would eventually replace Berwick Infirmary. Residents against the move are worried hospital services will be downgraded. Northumberland County Council said the new hospital would retain all the services that Berwick Infirmary offers and more. The cabinet agreed to fund the leisure centre part of the plan and work with Northumbria Healthcare NHS Foundation Trust on the £45m project. The 1990s-built Swan Centre is the council's "worst-performing" leisure centre with membership "shrunk so much" that it makes "significant losses". It generates about £600,000 a year but costs £840,000 a year to maintain, the council said. The authority said it would need to spend about £900,000 on immediate maintenance and at least £2.2m over the next five years on "essential works" to bring the Swan up to scratch. But residents "appear wedded to the Swan Centre site" which is "at the centre of the community". Although full details of the new sports centre are yet to be designed and approved by planners, the new centre would include a swimming pool, sports hall and gym. The hospital would have an inpatient ward, maternity care and a 24-hours minor injuries unit and offer more than 16,000 outpatient appointments a year. County Council leader Peter Jackson said: "Further consultation work will be done so the community has a chance to help shape the design and development of the new integrated facility."